The new Fluke 725 Multifunction Process Calibrator is a powerful, yet easy-to-use field calibrator. Use the measure and source functions to test and calibrate almost any process parameter. 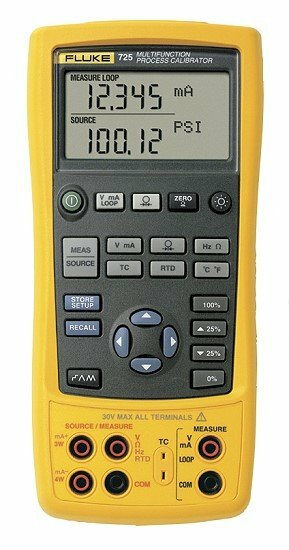 Take along the new Fluke 725 Multifunction Process Calibrator, and you're equipped to test and calibrate almost any process parameter. Measure and source mA, volts, temperature (RTDs and thermocouples), frequency, ohms, and pressure, using optional pressure modules. Do you need to calibrate transmitters? The 725's split display lets you view input and output values simultaneously. For valve and I/P tests, you can source mA while measuring pressure. The 725 has auto-stepping and auto-ramping for remote testing, plus 25% stepping for fast linearity tests. From the moment you pick it up, the Fluke 725 is ready to perform. Its simple controls, without menus, make operation easy. Its memory functions make set up fast. And its rugged design lets it work as hard as you do.